I just assembled a genome. How does it compare with already sequenced genomes? How do I find rearranged, inserted, or deleted regions? In this tutorial we begin with a new genome assembly just produced in the Unicycler tutorial. This is an assembly of E. coli C, which we will be comparing to assemblies of all other complete genes of this species. Are any of these genes essential? E. coli is one of the most studied organisms. There are hundreds of complete genomes (in fact, the total number of E. coli assemblies in Genbank is over 10,500). Here we will shows how to uploaded all (!) complete E. coli genomes at once. Our initial objective is to compare our assembly against all complete E. coli genomes to identify the most related ones and to find any interesting genome alterations. In order to do this we need to align our assembly against all other genomes. And in order to do that we need to first obtain all these other genomes. NCBI is the resource that would store all complete E. coli genomes. Specifically, they can be found here. As we will see, this list contains over 500 genomes and so uploading them by hand will likely result in carpal tunnel syndrome, which we want to prevent. Galaxy has several features that are specifically designed for uploading and managing large sets of similar types of data. The following two Hands-on sections show how they can be used to import all completed E. coli genomes into Galaxy. Open the NCBI list of of E. coli genomes in a new window and position two browser windows (one the tutorial and the one you just opened) side by side. Then follow the steps in the following video. Figure 1: A list of files for an E. coli assembly. For further analyses we need datasets ending with _genomic.fna.gz. Here we copy data from the spreadsheet described in the previous section into Galaxy’s rule-based uploader to download several hunder complete genomes into a Collection. Follow the steps in the video below. Now we have all complete E. coli genomes in Galaxy’s history. It is time to do a few things to our assembly. Paste https://zenodo.org/record/1306128/files/Ecoli_C_assembly.fna into the box. Galaxy instances contain hundreds of tools. As a result, it can be hard to find tools mentioned in tutorials such as this one. To help with this challenge, Galaxy has a search box at the top of the left panel. Use this box to find the tools mentioned here. Figure 2: Use search box to find tools! It contains two sequences: the one of E. coli C genome (the one we really need) and another representing phage phiX174 (a by product of Illumina sequencing where it is used as a spike-in DNA). Sequences have unwieldy names like >1 length=4576293 depth=1.00x circular=true. We need to rename it to something more meaningful. Let’s fix these two problems. “Fasta file”: the dataset you’ve just uploaded. (https://zenodo.org/record/1306128/files/Ecoli_C_assembly.fna). So in short we are replacing >1 length=4576293 depth=1.00x circular=true with >Ecoli_C. The Regular expression ^>1. *$ is used here to represent >1 length=4576293 depth=1.00x circular=true. Detailed description of regular expressions is outside of the scope of this tutorial, but there are other great resources. Start with Software Carpentry Regular Expressions tutorial. What is the meaning of ^ character is SED expression? Where do you go to learn more about regular expressions? It tells SED to start matching from the beginning of the string. Now everything is loaded and ready to go. We will now align our assembly against each of the E. coli genomes we have uploaded into the collection. To do this we will use LASTZ—an aligner designed for long sequences. “Select QUERY sequence(s)”: our assembly which was prepared in the previous step. Note that because we started LASTZ on a collection of E. coli genomes, it will output alignment information as a collection as well. A collection is simply a way to represent large sets of similar data in a compact way within Galaxy’s interface. warning It will take a while! Please understand that alignment is not an instantaneous process: allow several hours for these jobs to clear. Figure 3: LASTZ produced a collection where each element corresponds to an alignment between an E. coli genome and our assembly. Here one of the elements is expanded (to expand an element simply click on it). This will produce one gigantic table (over 12 million lines) containing combined LASTZ output for all genomes. Expand random subset of alignment data generated on the previous step by clicking on it. You will see “chart” button ( ). Click on it. You can also click on configuration button ( ) and specify axis labels etc. You can see that most alignments are short and have relatively low identity. Thus we can filter the original dataset by identity and length. Judging from this graph we can select alignment longer than 10,000 bp with identity above 90%. “With following condition”: c3 >= 90 and c4 >= 10000 (here c stands for column). NOTE: You need to select the full dataset; not the down-sampled one, but the one generated by the collection collapsing operation. Genomes that have the smallest number of alignment blocks but the highest overall alignment length are most similar to our assembly. This essentially means that they have longest uninterrupted region of high similarity to our assembly. “Input tabular dataset”: output of the previous Filter step. Click Insert operation to perform on each group button twice to add two more input boxes. Expand the aggregated data generated on the previous step by clicking on it. Figure 5: Number of alignment blocks versus total alignment length (bp). 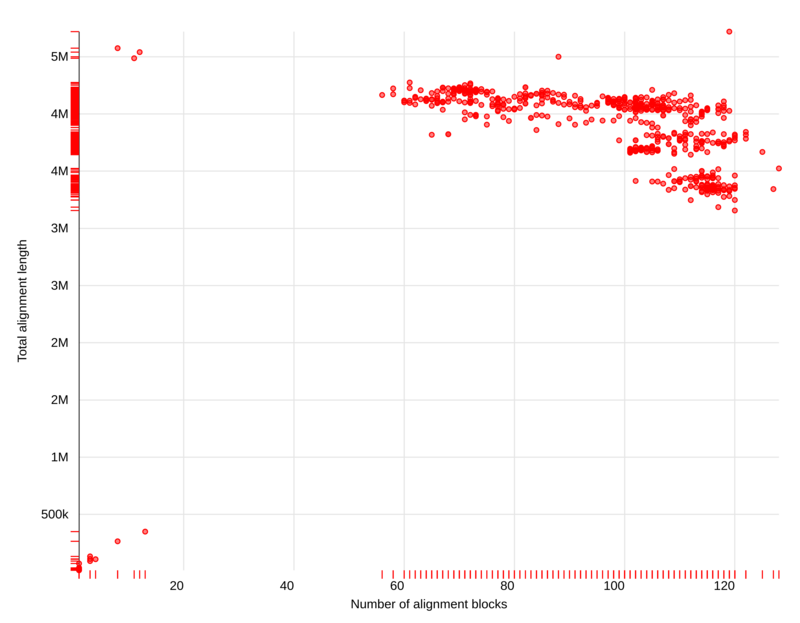 A group of three dots in the upper left corner of this scatter plot represents genomes that are most similar to our assembly: they have a SMALL number of alignment blocks but HIGH total alignment length. Mousing over these three dots (if you set Data point labels correctly in the previous step) will reveal their accession numbers: LT906474.1, CP024090.1, and CP020543.1. It is possible that when you repeat these steps the set of sequences in NCBI will have changed and you will obtain different accession numbers. Keep this in mind. “the pattern”: LT906474|CP024090|CP020543. (Here | means or). From this it appears that LT906474.1 is closest to our assembly because it has eight alignment blocks, the longest total alignment length (4,575,223) and highest mean identity (99.94%). Now that we know the three genomes most closely related to ours, let’s take a closer look at them. First we will re-download sequence and annotation data. At the end of this you should have two collections: one containing genomic sequences and another containing annotations. Figure 6: Dot Plot representations of alignments between three E. coli genomes and our assembly. Target (X-axis) is indicated above each dot plot. 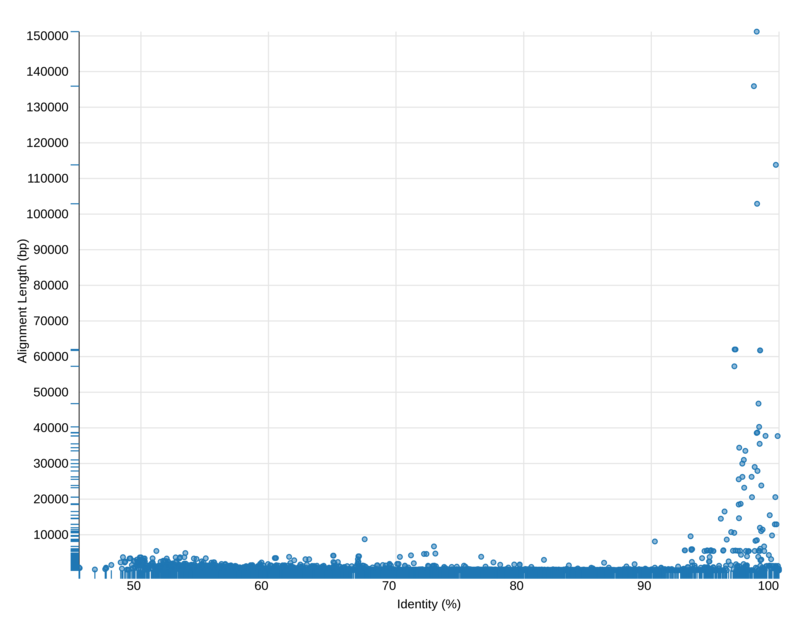 Query (Y-axis) is our assembly. Red circle indicates a region deleted in our assembly. Figure 7: A quick reference to interpreting Dot Plots. Our case is identical to Insertion into Reference shown in the upper left. For a moment let’s leave LASTZ result and create a browser that would allows us to display our results. The dot plots we’ve produced above are great, but they are static. It would be wonderful to load these data into a genome browser where one can zoom in and out as well as add tracks such as those containing genes. To create a browser we need a genome and a set of tracks. Tracks are features such as genes or SNPs with start and end positions corresponding to a coordinate system provided by the genome. Thus the first thing to do is to create a genome that would represent our experiment. We can create such a genome by simply combining the three genomes of closely related strains with our assembly in a single dataset—a hybrid genome. “Collection of files to collapse” the three genomes (collection) (in the video above we called it DNA). Note: Here we are matching from space (\ ) separating CP020543.1 and Escherichia coli C, complete genome and substituting this with nothing. Note: This tells to return all line that begin with > (^ signifies beginning of a line). Go to IGV web page and launch a browser appropriate for your platform. Wait for it to start. It will display human genome, but we will change that. Go back to your Galaxy session and expand the dataset generated during the last step. Create a single BED track containing alignments against all four genomes. Note: Here we are matching percent character % (it is pre-pended with \ because it is a special character, but we want sed to interpret it literally, as the percentage sign) and substituting this with nothing. This will produce a single dataset combining all alignment info. We can tell which alignments are between which genomes because we have set identifiers such as CP020543.13. Strand (+, -, or . for no strand data). Alignments are regions of high similarity between two sequences. Therefore each alignment block has two sets of coordinates associated with it: start/end in the first sequences (target) and start/end in the second sequence (query). But BED only has one set of coordinates. Thus we can create two BEDs: one using coordinates from the target and the other one from query. 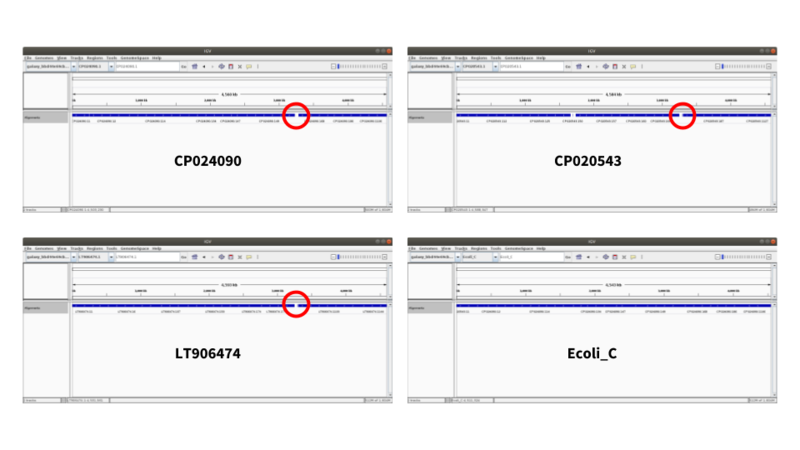 The first file will depict alignment data from the standpoint of target sequences CP020543.1, CP024090.1, LT906474.1 and the second from the standpoint of query - our own assembly we called Ecoli_C. In the first BED, column 1 will contain names of targets (CP020543.1, CP024090.1, and LT906474.1). In the second BED, column 1 will contain name of our assembly: Ecoli_C. To create the first BED we will cut six columns from the dataset produced at the last step. Specifically, to produce the target BED we will cut columns 2, 4, 5, 14, 12, and 8. To produce the query BED columns 7,9,10,14,12,8 will be cut. warning There are multiple CUT tools! The Hands-On box below uses Cut tool. Beware that some Galaxy instances contain multiple Cut tools. The one that is used below is called Cut columns from a table while the other one, which we will NOT use is called Cut columns from a table (cut). It is a small difference, but the tools are different. Click the pencil ( ) icon next to the last dataset in the history. Once we are at it let’s also rename the dataset to Alignments BED by changing the content of the Name box. You will see display with IGV local. Click this. After a few minutes you will see alignments rendered within the browser. 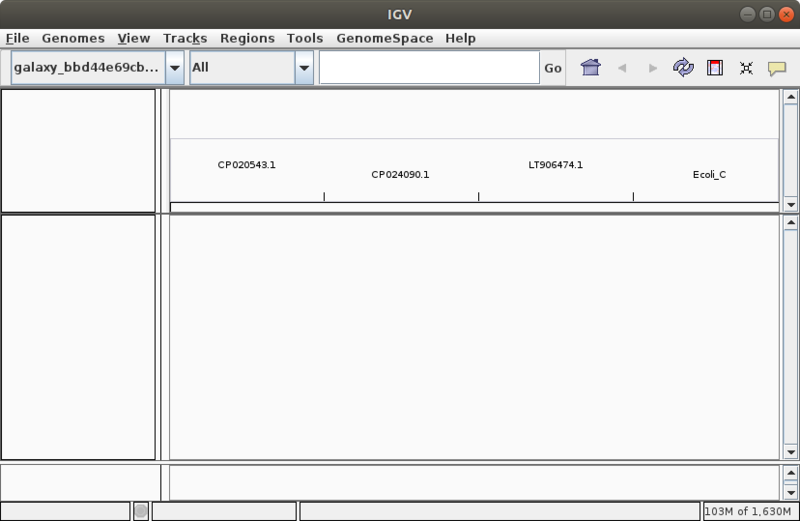 If you get Could not locate genome: error ignore it and click OK.
At the time of writing the datasets sent by Galaxy to IGV have uninformative names such as galaxy_bbd44h445645h45454. While this will soon be fixed we can deal with it by renaming the displayed track manually by right clicking on IGV sidebar and choosing the Rename Track.. option. 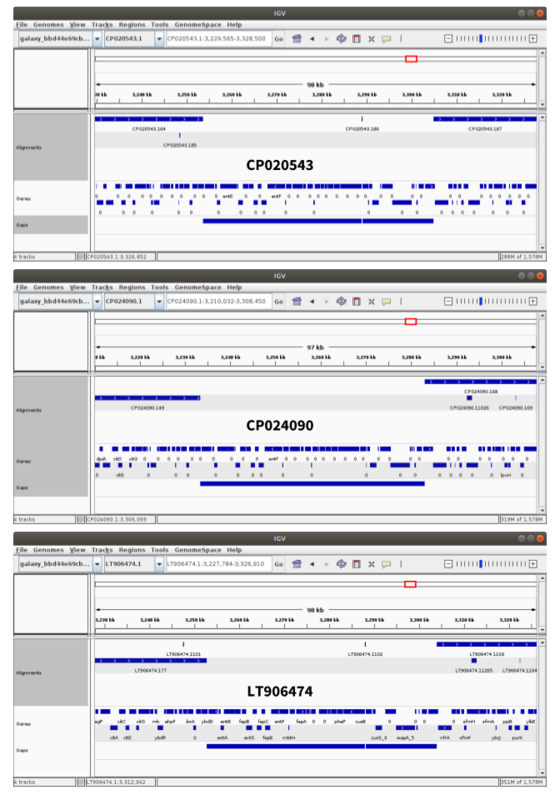 Figure 9: A collage of IGV screen-shots showing alignment tracks for the four genomes. The deletion from our assembly is highlighted with the red circle. It looks like a gap in alignments because target genomes are longer than our assembly by the amount equal to the length of the deletion. Now it is time to think about the genes. if an assembled-molecule, then reports the location/type value. e.g. if an unlocalized-scaffold, then report "unlocalized scaffold on <type>". reference a WP_ RefSeq accession. transcript accession corresponding to the protein feature. and some other features, this is the product name. units, and do not include the stop codon which is included in column 18.
col20: attributes: semi-colon delimited list of a controlled set of qualifiers. Note: This is because we want to retain all lines that begin (^) with CDS. This will create a 21st column containing 0 for all rows. Now we can cut necessary columns from these datasets. These columns are 8 (start), 9 (end), 15 (gene symbol), 21 (dummy column we just created), and c10 (strand). Note that we do not select a column corresponding to genome name. We will add this information on the next step. 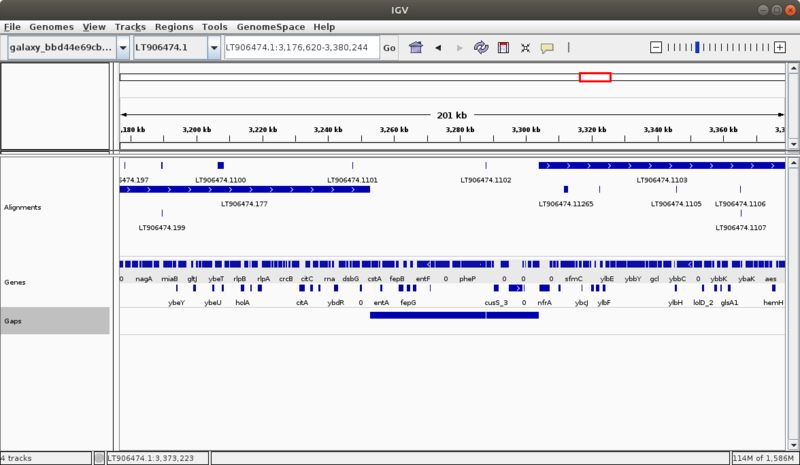 Figure 10: Gene track is added to the browser. Here we are zoomed in at the gap region in LT906474. Figure 11: Any set of genomic intervals can complemented or converted into a set of intervals that do not overlap the original set (image from BEDTools documentation). Figure 12: Complement of alignment bed shows the position of the insertion. 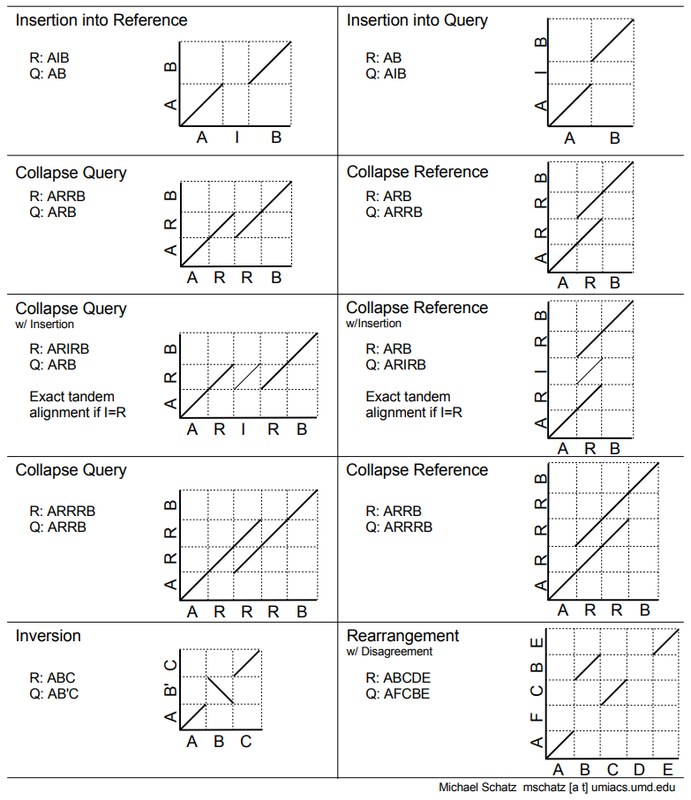 Figure 13: Computing intersect means finding overlapping regions in two BED datasets (image from BEDTools documentation). Note: Here we are computing the length (difference between end (column 3) and start (column 2) and making sure it is above 10,000). “With following condition”: c2 > 2000000. Figure 14: Close up of deleted region (this region is deleted from our assembly and looks like a gap when our assembly is aligned to genomic sequences shown here). In CP0205543 and LT906474 the continuity of the region is interrupted by a small aligned region that has relatively low identity (~72%). This is a spurious alignment and can be ignored. Upload this file into Galaxy using its upload tool. hands_on Hands-on: Are there essential genes? Once the tool is finished we will find that there are no essential genes deleted from our assembly. So our version of E. coli C is safe! This material is the result of a collaborative work. Thanks to the Galaxy Training Network and all the contributors ( Anton Nekrutenko, Delphine Lariviere)!